the nytpicker: Jay Maeder Gets Editors' Note For Self-Plagiarism In City Room Blog; Columnist Tom Friedman Still At Large. Jay Maeder Gets Editors' Note For Self-Plagiarism In City Room Blog; Columnist Tom Friedman Still At Large. In this morning's corrections column, former New York Daily News reporter Jay Maeder got his wrist publicly slapped for committing a sin practiced by Thomas L. Friedman, its own Pulitzer prize-winning columnist: he copied from himself. The difference, in this case, appears to be that Maeder lifted his lines from his former employer's paper, the Daily News -- while Friedman took his words from the NYT itself. Curiously, there's a contradiction between the Editor's Note as published in the paper this morning, and the one published online. The online note cites three instances of self-plagiarism -- one in each of the City Room blog posts written by Maeder -- while the print edition refers only to two. A City Room article on Monday about renewed criticism of the “Rough Boy” statue at Queens Borough Hall included descriptions of the historical background very similar to material the same author had published in The Daily News in 2000. And a Feb. 18 City Room article by that writer, about the naming of the George Washington Bridge, also included passages similar to an account he wrote for The Daily News in 2000. Had Times editors known of the earlier articles, those passages would not have been used. This post includes descriptions of the historical background similar to material the same author published in The Daily News in 1998. Had editors known of the earlier article, those passages would not have been used. Two other posts by this author also included descriptions similar to material he had previously written for The Daily News. How many times did Maeder copy himself, guys -- two or three? Get your stories straight and report back to us in tomorrow's corrections column. Although it's not quite the same as stealing someone else's words, the practice of self-plagiarism is considered unethical by most journalism professionals. 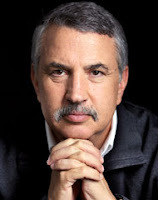 That's why we called attention to it way back in September of 2009, when Tom Friedman lifted an entire paragraph from a three-month-old op-ed column and put it in a new one -- a clear cut-and-paste job by one of the NYT's biggest stars. Well, there is one thing we know about necessity: it is the mother of invention....And when China starts to do that in a big way — when it starts to develop solar, wind, batteries, nuclear and energy efficiency technologies on its low-cost platform — watch out. You won’t just be buying your toys from China. You’ll be buying your energy future from China. What do we know about necessity? It is the mother of invention. And when China decides it has to go green out of necessity, watch out. You will not just be buying your toys from China. You will buy your next electric car, solar panels, batteries and energy-efficiency software from China. This isn't the only instance of Friedman lifting material from other columns to fill out new ones. In December of 2008, we noted Friedman's frequent use of the Flintsones as an ongoing metaphor to apply to all situations -- most often juxtaposing them to the Jetsons, for added emphasis. We don't excuse Maeder's apparent borrowing of language from his past work in the Daily News, and we suppose there's an added problem in using words that appeared in another newspaper. But it doesn't seem fair to call Maeder out on his mistake, while the NYT allows Friedman's repetition of ideas and phrases to appear without reprimand. The NYT needs a policy on self-plagiarism that applies equally to all its contributors, without fear or favor. Why would self-plagiarism be considered unethical? I'd certainly consider it lazy, and beneath what's expected of an NYT journalist, and a violation of an understanding between the journalist and the editor that the journalist make a best effort, but I don't think that ethics comes into play. The fact that it was lifted from material published in the Daily News seems to make this more of a copyright or other intellectual property violation. It's not self-plagiarism (there's no such thing) it's at best an unaccredited rerun. Some would consider it lazy, and laziness is unethical when many depend on your words. It's not the same as being too lazy to brush your teeth, It's like being a lazy firefighter, a lazy surgeon, or a lazy school teacher. Still, it's not as unethical a breach as outright theft, trespassing or other violations of private property. There's more of a risk to self-plagiarize if the writer is overly specialized. These writers tend to cast themselves into a corner and repeat the same line, or angle or idea over and over and over again. They bet on the rapid flow of information and a dearth of attentive readers to pass without critique. Like the closeted racist, the closeted scientologist, the closeted PR person passing as journalist, the all-snark and putdowns and nothing else parrot, the punting jackass, the roster of single-moded noisemakers is endless and noise pollution is a price of free speech. Wire services do this all the time. I agree it's harsh to consider it unethical. I am a journalist and have done it on occasion, ususally because I have to recycle different stories for different publications to make ends meet. If they are our words, we can use them when and how we like. Usually, when you submit something for publication, the expectation is that you're submitting original, unpublished material. So, if you slip in a big chunk of your own previously published material without your editor's permission, you're giving your client/boss less than what they assume they're paying for. That's sleazy. It's a big ethical violation to lift even one sentence from someone else without attribution. But as long as we're just talking a paragraph here and there, I don't think self-plagiarism is a big enough deal to warrant a public rebuke. How many ways are there for you to describe the historical background of a statue, or why a bridge was named one way or another, so that you do not repeat yourself? This is pretty silly, really. no sense reinventing the wheel.